Camiguin is a volcanic island paradise off the coast of Mindanao in Bohol Sea with seven volcanoes outnumbering the islands five towns. We were able to reach Camiguin from Cebu via a Cebu Ferry overnight trip to Cagayan de Oro (CDO) where a van waited for us and took us to Balingoan port in Misamis Oriental after breakfast at Jollibee Limketkai. With our van boarding a boat at Balingoan Roll on – Roll Off (RORO) port, ride to the beautiful island was over in 45minutes. We saw adjacent island of before reaching port of Benoni. Proceeding to our would be home in Albagon, and after a brief photo op in front of the branch of Land Bank where Camiguin is prominently displayed (a similar moment was done at the gate of Camiguin Beach Club later), we checked it at our destination that no cheap hotel or resort in Camiguin can match the price of our since it was offered to us free by a family friend of one of my co-travelers. Going about our restless pursuits, we hit the road immediately and again interrupted by a picture taking at a road side of Bonbon with Mt.Hibok-hibok, an active volcano that last exploded in 1951, in the background. A pilgrimage to the ruins of San Roque Church was made and picture taking ensued. It was here that Rolan drove all of us out of his camera frame to take a solo shot of himself. A stall near the place sells lanzones but it’s sour maybe because it’s out of season. Lanzones season is around September and October. A dip into the cold waters of Sto. Nino Cold Spring in Catarman town washed down our tired souls further refreshed by the refreshing water of Katibawasan Falls, a magnificent waterfall with a drop of about 70 meters. Nearby Katibawasan Falls is Ardent Hot Springs where we shifted to the healing properties of sulfur-laden hot water visited even by Koreans for its therapeutic power. Hurrying back to our “hotel” for dinner, can’t help but notice Camiguins rural charm-- people here burn coconut husks on the street to light up the place in the absence of electric light posts. After dinner and restful sleep, we boarded a rented boat to White Island, so called due to its white sand but actually a sand bar. The sandbar is surrounded by clear water ideal for snorkeling. We left the island afterwards, packed our bags, and bought Camiguin’s famous pasalubong,Vjandep’s pastel, before boarding the boat back to Balingoan port to go to our next destination: Bukidnon Province! Balingoan can be reached by 2 hour bus ride from Cagayan De Oro’s Agora Market. Ferry schedule at Balingoan starts at 6am to 5pm. Flights to CDO from Manila and other key cities of the country are available. SeaAir flies to Camiguin, check their website for the schedules and booking. The island can be toured via available jeepneys and tricycles on the island. To add spice to yout Camiguin itinerary, try these things, try visiting during Holy Week and participate in the Panaad where devotees walk the entire length of the cimcumferential road, all 64 kilometers of it, then do the stations of the cross visible on the highway. A trek up the mountains and volcanoes is also an exciting experience particularly mt. Hibok-hibok. During the third week of October, there's the annual lanzones festival for weeklong festivities. I used to come into this place (visiting distant relative) when I was still living in Butuan. The last time I was here was in 1994. 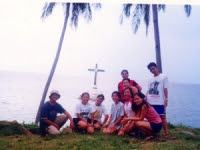 I have been to Camiguin with one of my then agent, the best adventure ever. The place is very nice, so provincial and the people are very kind even gave us some lansones eventhough we meant buying them. We did not hire any tour guide but instead relied on a Map she bought. White Island is the best however if you are a whitening regimen addict better not go there and just admire afar. any recommendation for any cheap places to stay? I will be going solo there. 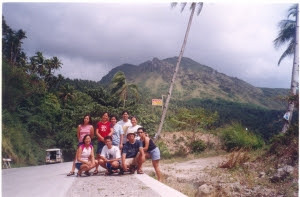 Im so amazed when I visited Camiguin last Oct. 2008. We stayed @ my ofcmate's house. There's so many tourist spots that can be visited there. We almost spend the whole day visiting all of them & the most beautiful is the White Island. I have been to Camiguin several times,in fact my wife is from there. The one thing that people miss when going there is the people. Most people see the island as tourists. I started out as a tourist, but now I have many friends and relatives there. When you live there,you get the whole picture, both the good and the bad. As I once heard said"a person is only as good as his/her worsed caracter trait." And this is true there. These are a poor people,but beyond that even living there and seeing what I have seen,they still have a sense of wanting to do for you whatever they can. The fact that I see all of this makes them a little more human. They are all respectfull whether they like you or not. All those who are younger are taught to show proper respect for their elders. Many will think that you have a lot of money(that usually starts out as being rich),until they know you and they get used to your habits. One of the unfortunate things that happens among tourists is that they will give the impression that they are being looked down upon. This attitude makes the amount of cooperation that you get a lot less. The more they are treated as equals, the more respect and the more life long friends you will make. The people on Camiguin in particular can be looked down even more than those in a larger city. So if you go,treat them as life long friends, give a chance to like you and not as a source of money. The people love to talk,so sit down, talk about yourself,how you got there,if you use a Credit Card to get there. What your business is,or what you do(whichever works)American music(they love our music, musical history is always nice) the more they know the better they will understand who we are. They hunger as (every where else)for information on who we are. I have noticed that there are many who are jealous of what we have accomplished here. Here I have found that letting them know how we got to where we are is a great help. Even if they do not believe you(which is more then likely) in time some them will. Having lived there, I am making progress in that area. Well I do hope that this will give you a good idea of what might be some good ideas that will make a more enjoyable trip. As they say "MAMBUHAY".